amidst gardens, meadows & forest, 3.5 hours north of San Francisco. 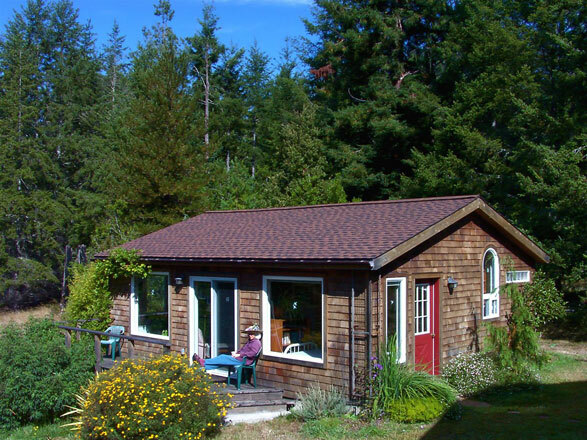 beautiful rural area just 1.5 miles from Pacific Ocean on 13 acres of gardens, meadows and redwood forests, with horses and llamas next door on our quiet, dead-end, paved road. We are 5 miles from the fishing village of Albion, 12 from historically preserved coastal village of Mendocino (an art, wine and food lover's paradise), and 20 to 30 miles from Fort Bragg's harbor, ocean fishing, whale-watching cruises, sand dunes, Botanical Gardens, the historic Skunk Train, two virgin redwood preserves, and many Anderson Valley wineries. Costs: $100 per night during the winter (Jan-March) and $130 per night April thru December, plus a one-time $50 cleaning fee and a 11% bed tax. There are no other fees and there is a 2-night minimum. The weekly rate (where you get 1 day free) is $600 in the winter and $780 April thru December plus $50 cleaning fee and tax. The monthly rate (where you get 10 days free) is $2000 in the winter and $2600 April thru December plus $50 cleaning fee and tax. To reserve your dates, please let us know by email or phone your name and contact info andwhat dates you want. Once we confirm your reservation mail a $150 deposit check to Tom Wodetzki, 31901 Middle Ridge Road, Albion CA 95410. You can pay the balance due by check or cash when you are here. Refund policy: If you cancel more than 20 days before your arrival date, you will get all your deposit back. If you cancel from 10 to 20 days before your arrival date, you will get half of your deposit back. If you cancel less than 10 days before date, no refund since it will probably be too late for us to rent the cottage to others. Note that we have video and DVD players and a TV set for movies, but we do not get TV reception or cable. Cell phone reception is sketchy-- it works for some carriers and not for others. 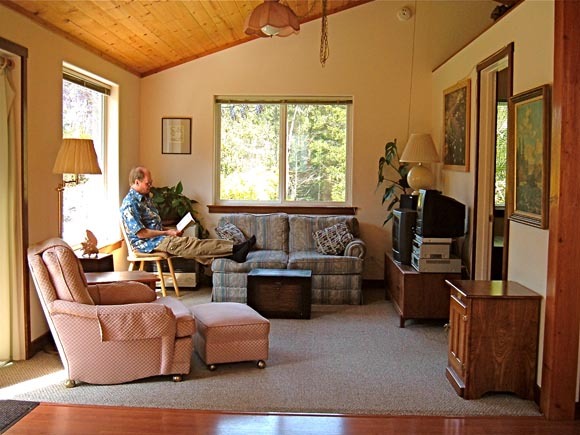 There is a phone in the cottage (707-937-5602) in case you want to give it to family or friends, and which you may use freely for local calls. The internet is accessible thru a high-speed Internet connection via a satellite dish. 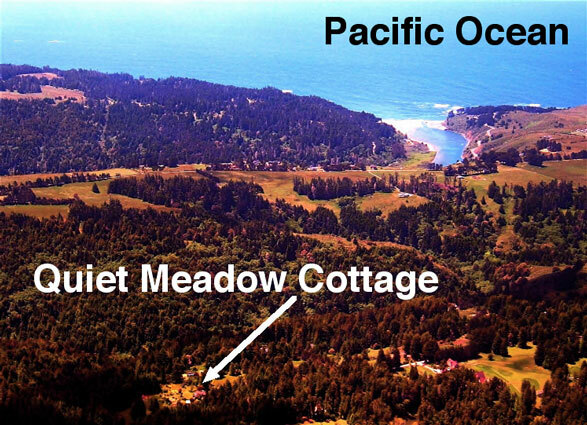 The cold Pacific Ocean 1.5 miles away keeps our summer daytime temp below 80 degrees-- 60 degrees during foggy days-- and nights can go as low as 45 in summer and 30 in winter. Bring layers. The cottage is heated centrally by a Monitor propane heater whose thermostat you can adjust to your desired temperature. We do provide all bedding and towels. The check-in time is 3pm, and check-out is noon. We do not provide breakfasts or meals. The kitchen includes a propane stovetop, mini-fridge, sink, microwave and toaster ovens, stick blender, toaster, coffee maker and tea kettle, plus sugar, salt & pepper, and usually some teas. You need to bring your own coffee, cream and all the food you want to eat. Many restaurants are available in the area, and Albion village has a good little grocery store and deli. Driving directions are at the bottom. "Thank you for creating such a spacious, uncluttered, tranquil environment. This lovely cottage, deep rest, miles of quiet, and black nights all conspire to ease my wound-up nerves." "This is truly a special place. I was looking for a retreat and I found more... I found myself again. Thank you for creating a safe, warm space and sharing your incredibly beautiful property." "You have a truly magical world here and a cozy cottage to comfort guests. Being here in this enchanted forest is a true gift." "Thanks for this lovely space to rest and become restored. The nature, the quiet, the warm and sunny days have left us all softened around the edges." "This is my 5th time staying here in this cozy space. Your land is more beautiful than ever and the peace and quiet so supportive. The blooming wisteria on the deck was an extra delight, truly lovely." From San Francisco, get onto Highway 101 North and cross the Golden Gate Bridge. Continue north on 101 for 80 miles to Cloverdale. Exit on the 3rd Cloverdale exit, where the signs say Hwy 128 West, Fort Bragg, Mendocino, Boonville. Follow those signs and take Highway 128 northwest 55 miles thru beautiful Anderson Valley to its end at Coast Highway 1 and the Pacific Ocean. Pass the Albion village on your left and drive 4 miles uphill to Middle Ridge Road, a paved road on the right. Turn right and drive down Middle Ridge Road 1-1/2 miles and turn into the first driveway on the left after the 1.5 mile marker, at the 31901 and 32033 signs. The drive forks immediately; take the left fork up to our guest cottage and home. Park in the slot on the right that says "cottage parking." Welcome to your Quiet Meadow Cottage!